My bare feet search for one step after another. Minutes ago, I was snug in my bed next to Don. Something awoke me. I head downstairs to the family room where I meditate and journal in the morning. The sky is dark at 5 AM. I step into the family room and am struck by light pouring through the west window. Then I see her. A full Moon sits cradled in the arms of our magnolia tree. She with the power to pull oceans out of their beds pulled me out of mine. I stand blessed by her brilliant beams. She reminds me that everything has cycles of change. Rocks, seashells, solar systems, amoebas, groundhogs, trees, bears and bunnies are unfolding. We are all unfolding. Our lives are richer for that understanding. We can settle into each moment as if it is a giant nest when we embrace that awareness. We are all part of an unfolding Mystery. I sit and begin to write. When I look up, she is half hidden, A large oak tree runs straight up her middle. Her roundness playfully peeks out from either side of the great tree’s trunk. 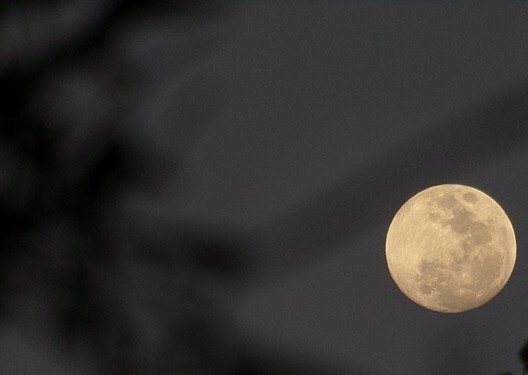 After journaling I listen to an astrologer who speak about this glowing “Super Moon.” She says we’re being called to bring more joy into the world. I doubt that any one would deny that the world could use more happiness. This observation starts me thinking about joy. How much time do I spend thinking about bliss? Do I think about ways to add joy to my day, or how to send it into the world? When was the last time I contemplated what brings me joy? Nature is an easy place to discover joyful moments. Delight fills me when the Daffodils poke their green fingers up through hard-brown earth or when the crocus peak through the snow. I delight in the changes that the goldfinch makes changing from yellow in summer to wintery grey and back to yellow as summer nears. I also feel joy when Don walks through the door. It is a joyful moment when one of my children calls me or when one of our granddaughters send me a text. These are moments of elation. I thrill to the sight of them walking through our door for yet another family celebration. I experience ecstasy as I create. I am elated witnessing others as they take courageous steps. Shared silence brings quiet joy as does a chapel or cathedral. Joy is possible in many ways. How long can I hold moments of joy? Interestingly, feeling angry about being cut off in traffic often returns to my thoughts many times during a day. Unlike joy, upsetting moments have staying power. Choosing joy means actively redirecting my thoughts to blissful moments not to cover over difficult emotions,but to find room for peace in a pleasurable breath so I can be present to what must be faced. Take note of joyful moments. Return to them throughout the day. Pay more attention to Moon cycles than News cycles. 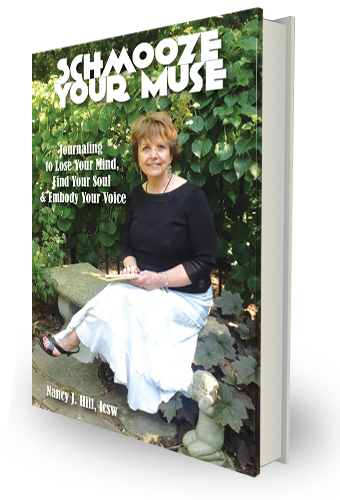 Get immediate access to your free e-book, Schmooze Your Muse: Journaling to Lose Your Mind, Find Your Soul and Embody Your Voice. This ebook is forty pages that show you a process that I created while writing my book Unfolding. Simply enter your name and email address below to get your free copy now.